The third game of the series “Gold & steel, Cortés et la conquête du Mexique 1519-1521 ("Cortes and the conquest of Mexico 1519-1521") is a historical simulation featuring the “first war of the worlds”; Spain, the rising European power and the Central America dominant civilization, the Aztec Empire. This a medium to high complexity 2 players game. One turn is 2 months, and the game is played in 14 turns. 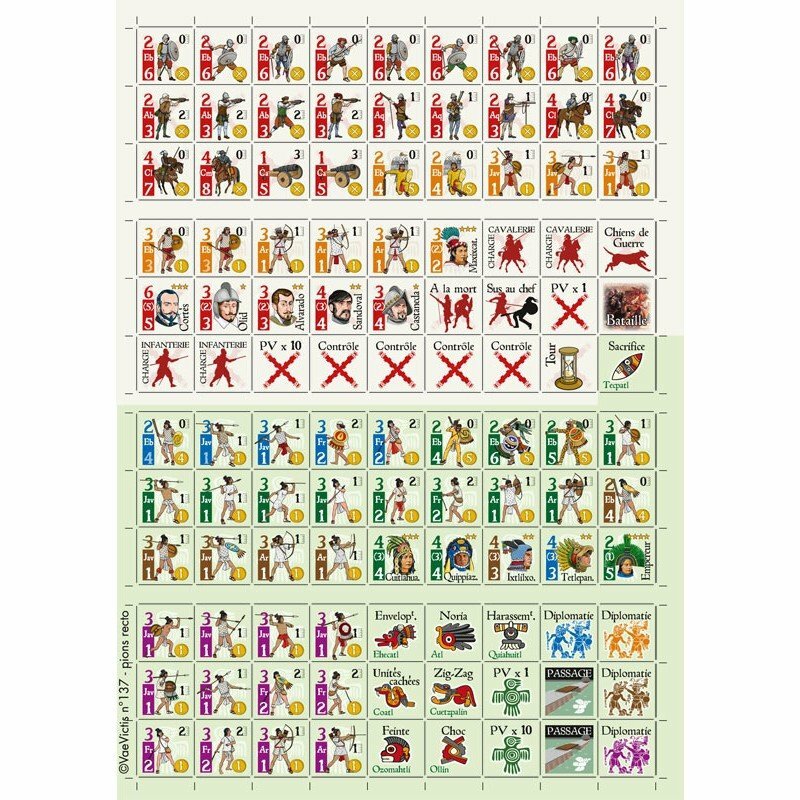 One player plays the role of the Aztec Empire, or the Triple Alliance (an alliance of three city-states: Mexico-Tenochtitlan, Texcoco, and Tlacopan) and the other player plays the infamous Conquistadors lead by Hernan Cortes. 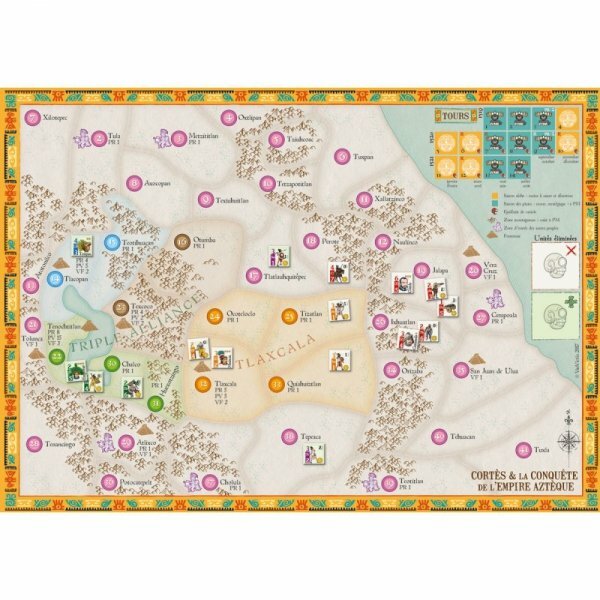 The objectives are to take control of the different territories (city-states and the most important Mexico-Tenochtitlan), to win pitched battles or major sieges, to eliminate units and leaders by sacrifice! This is both a strategic & tactical game with armies and garrisons evolving on the main strategic map showing Meso-Indian Central America and units fighting on a tactical map featuring a typical XVIth century battleground. 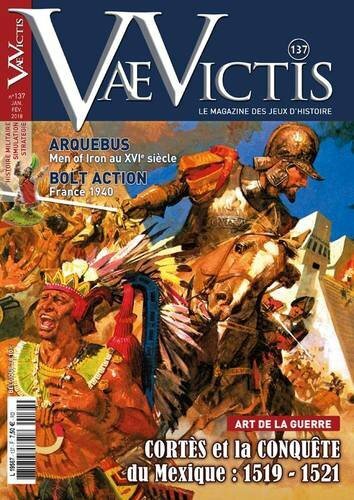 Spanish units are swords & bucklers, arquebusiers, crossbowmen, ginetes (light cavalrymen), medium cavalrymen, and early cannons (from 50 men at full strength, 30 horsemen or 10 cannons of all calibers). The Indians units (all Aztecs, Tlaxcaltec and All other Indians peoples) are knight orders such as Jaguars, Eagles, Cuachicqueh, javelins throwers, bowmen and most feared by Spaniards, the slingers. 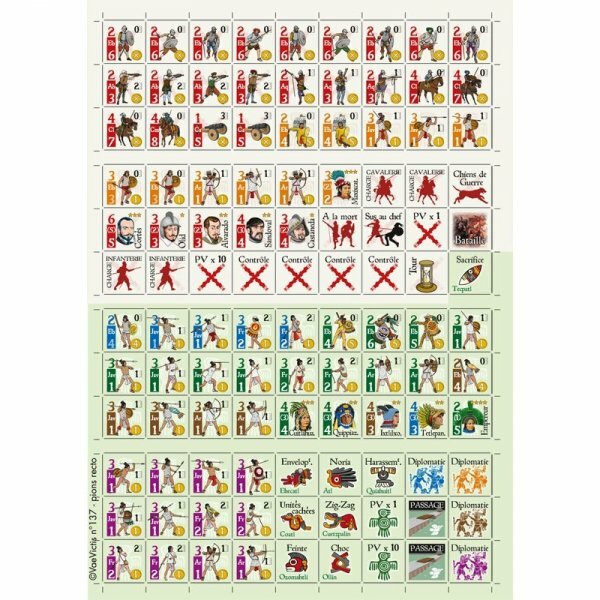 The ambience of that period is added with tactical chits with specific application for the fights – shooting and close-combat – (for the Conquistadors: war dogs, infantry or cavalry charge, fight to death, kill the leader and for the Aztecs : arrows and javelins harassment, zigzag, shock, feint movement, wrapping up, hidden units, noria) and events such as rain, sacrifice, fight to death, no fight or betrayal. There are two combat tables; one used by Spaniards, the fight to death (the objective is to kill most enemies) and the flower war used by the Aztecs (the objective is to sacrifice most Spanish soldiers).